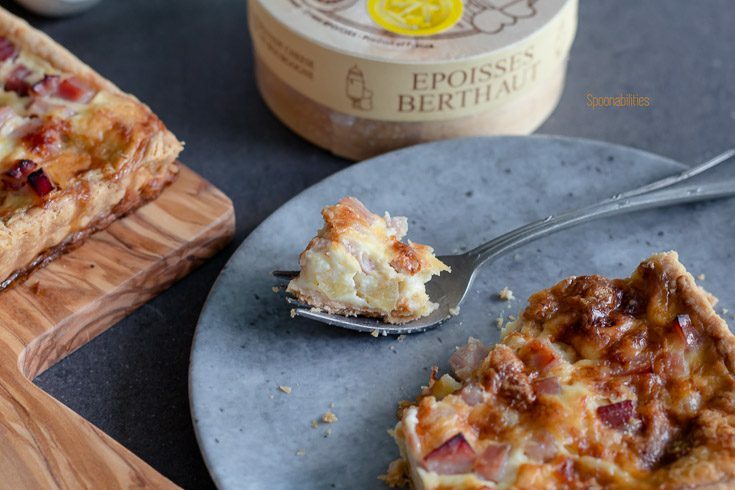 Époisses Ham Apple Tart has a flaky crust which supports the rich savory custard filling made with eggs, deli ham, heavy cream, pink lady apples and the most delicious stinky French cheese Époisses. This tart is excellent as an appetizer or for a light dinner with a green salad. Hello my friends. I hope you are having a fantastic week. I’m certainly having a super relaxing week as this is the first week of my two week stay-cation from my full-time job. I didn’t realize until a week ago that I had a bunch of days to take before my anniversary date on March 27th. If I don’t take the days off, I lose them. So here I am. At first, I was unsure what to do during these two weeks, and I thought this vacation would be a waste of time without being productive. But honestly, I really needed this time off so badly because I was feeling so burnt out and emotionally feeling like I was on a roller-coaster. So, I decided to take this time to re-charge, de-compress, relax and do things that make me happy. That’s what vacations are for anyway, right? During this first week, I have been spending time walking, riding the bike around town and having an enjoyable time sitting in coffee shops watching people and nature, and catching up on reading all my food magazines. I’m hoping by the end of this relaxing vacation I will be full of positive energy and inspiration to create more delicious and healthy recipes for you. OK, enough talking about me. 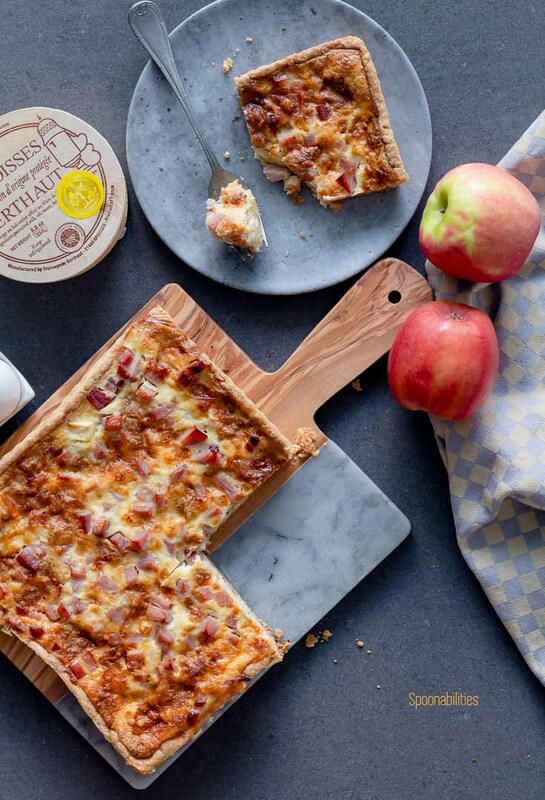 Let’s dive into this week’s recipe with this Époisses Ham Apple Tart. This delicious tart was one of the last recipes I did last year. I had picked this recipe from Food & Wine magazine because I had some Époisses cheese in the freezer from the Holiday / Wine and Cheese Tasting Party that we had over a year ago with our friends. 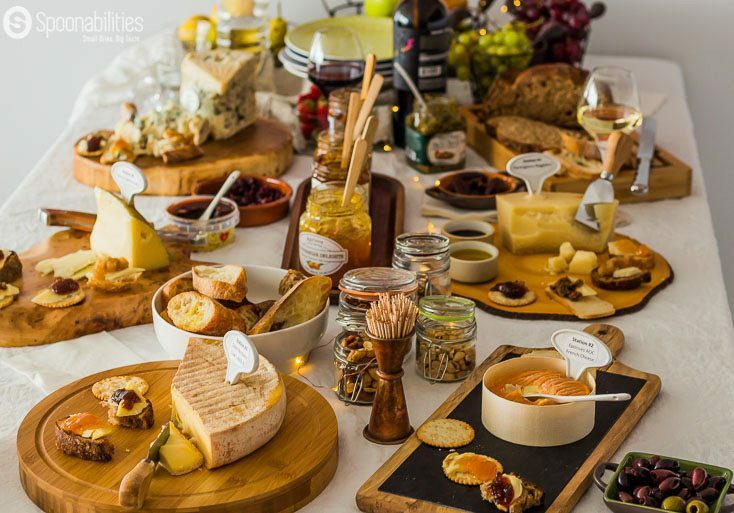 I got carried away buying cheeses for the party and I had so much left over. So I decided to freeze the cheeses, but I wasn’t sure if this was a good idea because when I looked online, I didn’t find the answer. Now, I can assure you that you can freeze cheese and after a year the cheese still has the same taste, texture, and quality. Like always, there is no product left behind in this house, so I adapted this cheese & ham apple tart recipe with the ingredients I had. For another example, I used pastry flour instead of all-purpose flour. 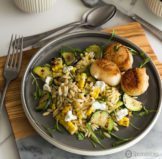 I love finding ideas for using leftover half-used ingredients sitting in the refrigerator or pantry. If you have anything in your fridge that you don’t know what to do with, let me know and I’ll send you some ideas. Époisses Ham Apple Tart is very easy to make, and the only thing that will take a little effort to prepare is the dough for the crust. Everything else will take no more than 10 minutes to prepare. 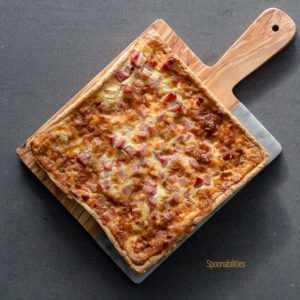 In the recipe card below, you will find the steps of how to make this rich and delicious ham apple tart. You can eat this tart for dinner with a simple peppery arugula salad and champagne mustard vinaigrette to balance the flavor. Or you can serve it at your next party with your friends. They will be very impressed with the unique taste of this tart. Let me tell you a little bit about this pungent French cheese from Burgundy. Époisses cheese is one of the most delicious and famous stinky cheeses in the world. It has a pungent smell from unpasteurized cows’ milk with a soft texture and a robust fruity flavor, and a unique orange/red rind. This cheese is served with a spoon because of the smooth, creamy texture. The rind is edible, but kind of salty with a mildly bitter flavor, soft but doesn’t influence the overall taste of the cheese. The orange/red color of the rind is due to the way the cheesemaker washes the cheese three times a week for six weeks. 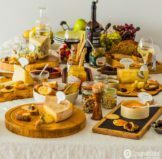 How is Époisses Cheese Made & What is a Good Substitute? The Époisses cheese is formed in an 8-ounce wheel, then salted and air-dried. Then, the cheese is hand rubbed with a mixture of brine (salt water) and marc. Marc is a rough brandy (think grappa) that is made from the skins, seeds and stems after grapes have been pressed for winemaking. This mixture, called pomace, is then fermented to produce marc. 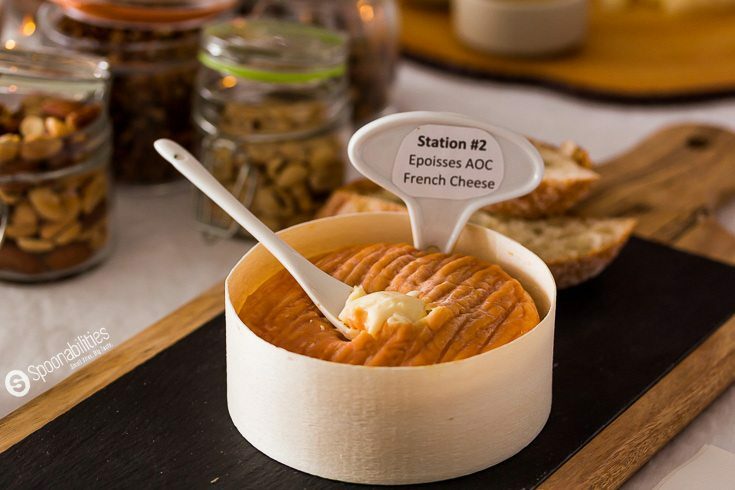 The texture of Époisses cheese after 30 days is lightly grainy, and at 40 days is a sticky, creamy and velvety paste – “spoonable” at room temperature when well-aged. 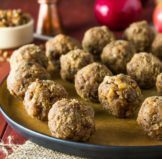 The flavor is earthy/grassy, salty, nutty, buttery, sweet, and melts in your mouth. If you cannot find Époisses cheese or it’s a little bit pricey, you substitute Muenster, Pont l’Eveque or Taleggio. Our wine pick for our Wine and Cheese Tasting Party and for the Époisses Ham Apple Tart was Cloud Break Chardonnay from California. From the maker: Cloud Break Chardonnay is ripe and full-bodied with delicious aromas and juicy flavors of pineapple, tropical fruit, and toasty oak, balanced with creamy overtones for a lingering, memorable finish. I hope you get to make this outstanding Époisses Ham Apple Tart and I would be very exciting to hear from you with your feedback and photos. Remember to tag us @Spoonabilities if you post the photos in social media. Have a great week! 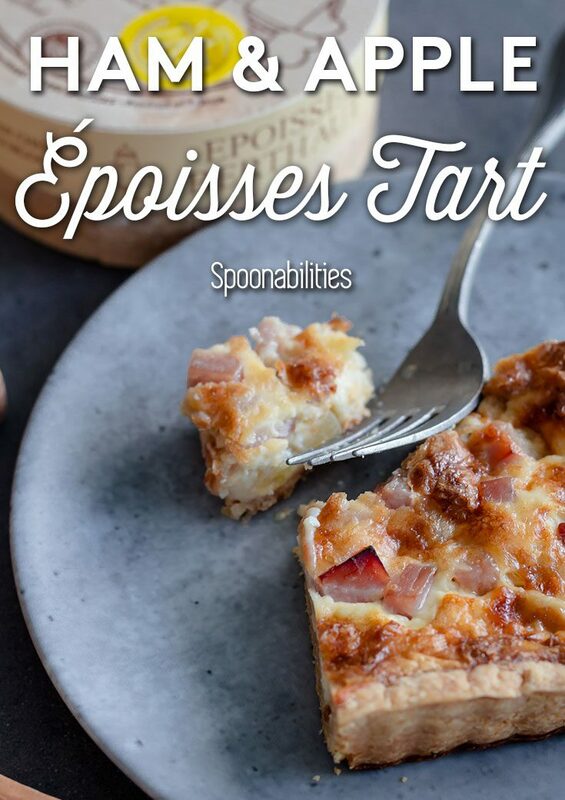 Époisses Ham Apple Tart is a delicious French recipe with a creamy, custard filling of salty deli ham, sweet pink lady apples, and Époisses cheese. This French cheese is stinky and pungent, and has a heavenly taste that is buttery, sweet, grassy and salty that melts in your mouth. Adapted from Food & Wine Magazine. 1 3/4 cups all-purpose flour, plus more for dusting. I used pastry flour – I mention why above. 1/2 teaSpoon kosher salt. The original recipe asked for 1 teaSpoon but I think the ham and cheese are a bit salty already. In a food processor, pulse the 1 3/4 cups of flour with the kosher salt. Add the cubed butter and pulse until it is the size of small peas. Add the egg yolk and cold water and pulse until the pastry is moistened. Turn the pastry out onto a lightly floured work surface. Gather any crumbs and pat into a disk. Wrap the disk in plastic and refrigerate until firm - about 45 minutes. Preheat the oven to 375°. On a lightly floured surface, roll out the pastry to a 13-inch round, or square if your mold is square like mine. 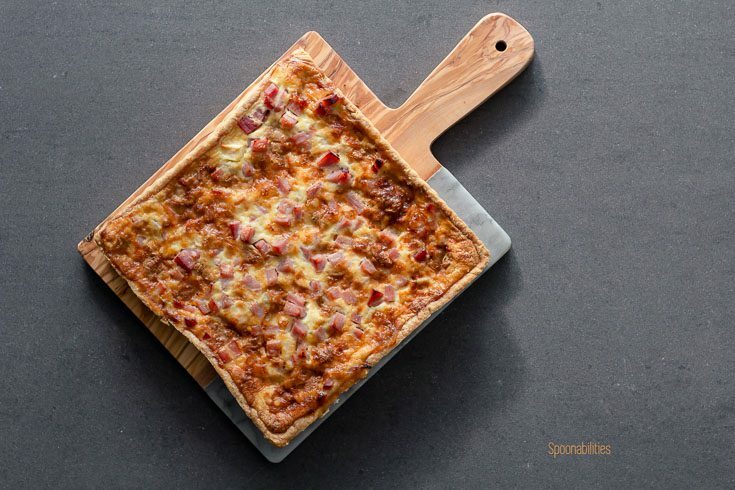 Ease the pastry into an 11-inch fluted tart pan with a removable bottom, pressing it into the corners and up the sides. Trim the pastry 1/4 inch above the rim of the tart pan and use the excess to patch any holes or thin parts. Refrigerate the tart shell until chilled - about 15 minutes. Line the tart shell with parchment paper and fill with pie weights or dried beans. Bake the shell for about 30 minutes, just until dry. Remove the parchment and weights, and bake the crust for about 15 minutes longer, until golden. Let cool slightly, then transfer the tart pan to a large baking sheet. Scatter the Époisses, apple and ham evenly in the tart shell. In a bowl, beat the eggs with the heavy cream, salt, white pepper and nutmeg. Pour the custard into the tart shell and bake for about 45 minutes, rotating the sheet halfway through baking, until the custard is just set and lightly browned on top. Transfer the tart to a rack and let cool for 30 minutes. Remove the mold ring (or square), cut the tart into wedges and serve. Make Ahead: The tart can be refrigerated overnight. Let it come to room temperature before serving. Thank you Natalie:). This is a wonderful tart. That combination of flavors sounds absolutely perfect. This is going on my “to try” list immediately! Hi Allison, I would love to hear from you if you get to try it. This tart is amazingly delicious. I imagine that ham and apple taste amazing together! Yes, Diana. The ham and apple give such a fantastic flavor to this tart. ooo… this looks like such an awesome little meal. I would love to try this and your pics are spectacular. Thank YOU so much, Ben! It’s lovely to hear your feedback :). 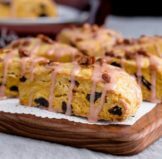 This tart would be perfect for Easter brunch! What a great idea Quinn!! I didn’t think about this idea for the post. Thank you! Wow I’ve never tried Époisses cheese, but oh my gosh, your description has me wanting it right now. Yum! 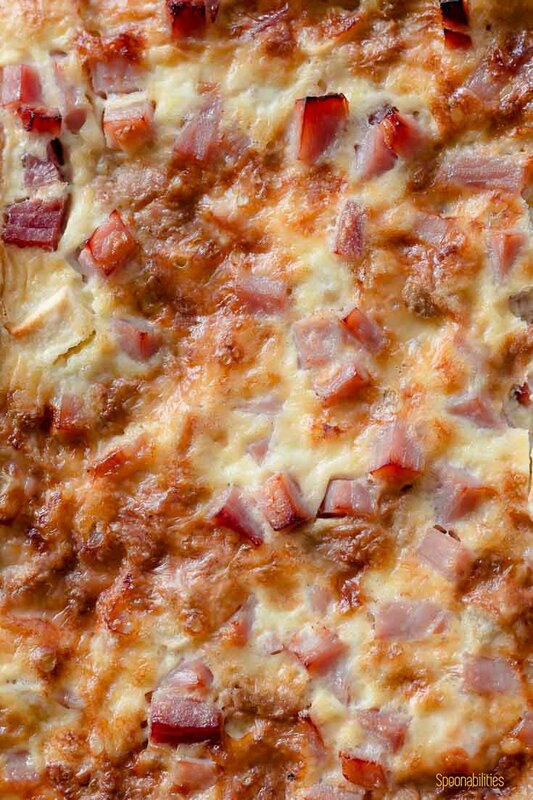 Love the idea of it with ham and apples too…all my favorites in one tart. Thanks for the inspiration! Hi Traci, your comment makes me SO happy. So, this makes me feel that I’m doing a great job describing my food through my words. Thank you! Ah, you had me at Epoisses. My favorite cheese ever. It’s so perfect just ooey gooey that I’ve never cooked with it or baked it, but I can see why you did after freezing it. What a beautiful cheesy party you had! Have you ever had Reblochon? Another stinky cow milk cheese. Heaven. Hi Mimi, I’m glad that you get me with this cheese. I still think this cheese is better to try in his natural form to taste the excellent flavor, but this tart surprised me how the flavors came together so wonderfully. I never try Reblochon and for what I read is very a very similar cheese. I will keep it on my list to try pretty soon. Thank you so much for the recommendation!